The Pseudosasa genus includes many species, some of which are known to be hardy and suitable to grow in western temperate gardens. 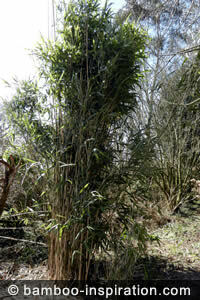 As with many bamboos the species are originally from Japan and China, they achieve medium to tall heights, and with leptomorph rhizome systems it is rare for them to cause any issues in cooler climates as they tend to form tight clumps, but you must pay attention to any mention of running growth habits from specific species. A species list is provided at the bottom. Plants in this genus tolerate a range of temperatures right down to -20 °C (-4 °F) but this does not apply to all varieties, so again it’s important to check with different species to make sure of the tolerance to cold conditions in your region. For example, the incredibly hardy variations of japonica seem to be able to survive and thrive anywhere and are rated as suitable for zone 5-6, -23 °C (-10 °F). Whereas Pseudosasa amabilis may only be hardy to -12 °C (10 °F), in my mind that means it needs a warm garden! Species spreading characteristics can vary between clumping and running. I have several japonica, two of which are aggressive spreaders and the rest that just stay in tidy clumps and have made no attempt to spread at all, even though they are well established. I put the tendency to spread down to conditions and the possibility of rhizomes looking for a water source. The two that are spreading aggressively are on top of a bank and could be short of water when it’s dry, the ones that stay in clumps are in and around shaded tree areas and the ground never dries out. Well suited for screens, groves, windbreaks, and hedges, except perhaps with owatarii as it is a short plant, more like a big ground cover, but it may also suit growing on top of a bank for a short un-pruned hedge. 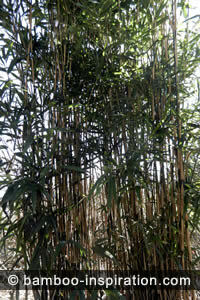 Some are excellent to harvest for garden canes and amabilis is the species used for fishing rods. The genus Pseudosasa includes nearly 70 different species but I am only listing the ones I know are the hardiest within the approx. 20 accepted species names.